It’s important to note that Blockheads does have a burrito lunch special that comes with chips, salsa and a drink for $8.95.Â In order to fairly compare the two restaurants, however, we had to order the exact same items from both places. We ordered Chicken Fajita Burritos, Guacamole and Chips, and two Diet Pepsi’s from each. 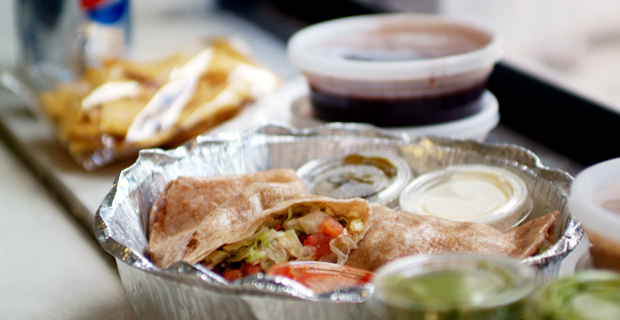 It took Blockheads over 3x the amount of time it took Burritoville to deliver our burritos. We received our Burritoville delivery in 18 minutes and finished our food before Blockheads even left their premises. Blockheads clocked in after 58 minutes (most embarrassing! ), and to make matters worse, the delivery boy was too lazy to take the elevator upstairs to bring the food to our door.Â In fact, he lied over the phone and said he didn’t have his ID, and then was dumb enough to have his wallet open with his ID in it when we got downstairs. For those of you who have an hour or less for your lunch break, avoid Blockheads, or be sure to order ahead of time. While neither restaurant’s packaging was very special, Blockheads’ burritos came in the standard round tin containers, which wasn’t the best vessel for delivering a burrito. The weirdest part, though, was that their burritos came with the rice and beans in separate containers on the side. This was really peculiar as I’ve never seen a deconstructed burrito before, and it seemed like a waste of plastic. It was also a waste of our our time, seeing as we had to attempt to build our own burrito (not easy when the tortilla is the consistency of a waterlogged pancake). Their chips came prepackaged in a sealed plastic bag that was a little hard to open, but definitely looked nicer than Burritoville’s chip pile. Burritoville individually wrapped each burrito in foil and paper. 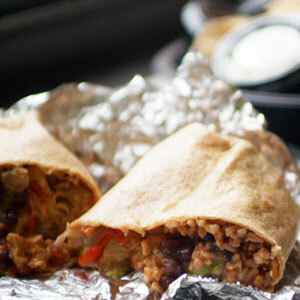 This made their burritos easy to hold and eat, and was ideal for storing any leftovers. They also included two free bags of chips and salsa, which was a really nice touch.Â Burritoville would have won this category as well, but they made one fatal mistake… they failed to deliver one of our Diet Pepsi’s! We had to dock points for that delivery no-no. Burritoville had the better tasting food hands down.Â First of all, you have the tortilla options of white, wheat, sun-dried tomato or none; cheddar, Monterey Jack or soy cheese; black or refried beans; sour cream or tofu sour cream; and hot or mild salsa. Blockheads only gave us the option of white or wheat tortillas, white or brown rice, and tofu sour cream, although you could add vegan soy cheese at an extra cost. Burritoville’s Chicken Fajita Burrito actually had the typical Fajita elements in it like red peppers and caramelized onions. All the flavors came together in a fajita-burrito explosion, and it was delicious!Â The cheese was a decadent melted blend of cheddar and Monterey Jack, and it was the perfect texture to balance out the chicken, rice, beans, guacamole, salsa and sour cream. As I mentioned before, Blockheads’ Chicken Fajita Burrito came with the rice, beans, guacamole, sour cream, and salsa on the side. In theory, it’s nice that they let us choose how much fat and carbohydrate we’d like to add to our burrito, but when you have a tortilla filled with nothing but lettuce, tomatoes, chicken and sauce in a loose tin container, there is absolutely nothing there to stop the burrito from becoming a giant soggy mess. Each burrito sat in a puddle of lettuce juice, which was exactly as appetizing as it sounds. It was difficult enough to get a bite into your mouth with a knife and fork, let alone reassemble it with the rest of the ingredients. Burritoville’s chips were nothing special, and their guacamole was a little too heavy on the cilantro and red onion.Â Blockheads’ chips and guacamole, on the other hand, were about as good as delivery chips and guac can get in Lower Manhattan, but not good enough to make up for their inedible burrito. Of course, as we noted before, Blockheads does have a $8.95 lunch special which is much closer to Burritoville’s $8.75 price tag. However, considering the quality of the burrito we ate today, that lunch special isn’t even tempting. I think it’s safe to say that today’s race did not bring us any closer to finding West Coast quality Mexican food in New York, and it’s even safer to say that Lower Manhattan is probably not the place to look. We pitted Blockheads and Burritoville! Who wins? I found this review extremely helpful and i cannot wait to go to these spots to try them out! Gracias! !